These codes are SERIES SPECIFIC. 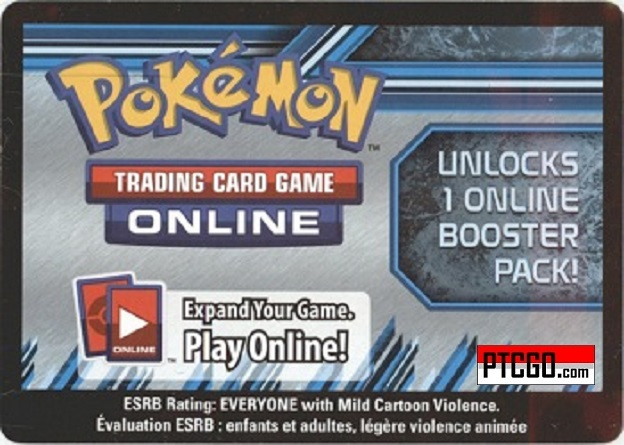 Which in short means, a Pokemon PLASMA STORM Code can only be redeemed for a Pokemon PLASMA STORM Online Booster Pack in the Pok�mon TCG Online shop. You will not be able to purchase this code and use it to unlock digital booster packs from any other expansion except the PLASMA STORM Expansion. You are NOT purchasing actual physical card but the code delivered to you thru email which will give you a Pokemon Online Pack to access to play online. 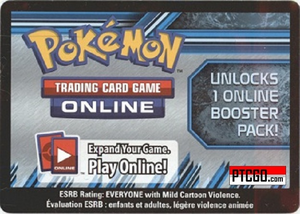 The code you are purchasing will unlock a pack of Pokemon PLASMA STORM cards to your online account for play. Plasma Storm is the eighth expansion of the Black & White Series of the Pok�mon Trading Card Game. This set is centered around Team Plasma and features Lugia. It was released in the US on Feb 6, 2013 and it has over 135 cards. Plasma Storm includes eight Pok�mon-EX: Moltres-EX, Victini-EX, Articuno-EX, Zapdos-EX, Cobalion-EX, Black Kyurem-EX, White Kyurem-EX, and Lugia-EX. Only four were given two different prints, one regular version, and one Full Art version each; they are Victini-EX, Articuno-EX, Cobalion-EX and Lugia-EX. Clouds gather, Energy crackles, and when you play the Pok�mon TCG: Black & White�Plasma Storm expansion, a new force will be felt as the tempestuous Team Plasma makes its debut! All must make ready for a new battlefield, featuring electrifying Team Plasma Pok�mon, game-changing Trainer cards, and Team Plasma Pok�mon-EX such as Articuno-EX, Zapdos-EX, and Lugia-EX. And, as all-new, powerful ACE SPEC cards blast the balance of power and even more amazing Pok�mon-EX race into battle, a question must be asked: Trainers, are you ready? . This a great service, although clearly needs a bit more polish. I would still recommend, follow up on the mistakes the seller made was prompt and adequate. I was skeptical at first, but website does checkout and is legit. Definately recommended. I've purchased dozens of these. The delivery has always been speedy. I've only received one invalid code from them, but a simple and quick email to their customer support had the issue resolved in minutes. The service couldn't have been faster and the codes worked great. Definitely will use this again in the future. Low prices and quick service! Excellent store! It's so nice to be able to talk to an actual person who wants to help speed up the process instead of making you wait! WOW, Super Fast Email Delivery! These Pokemon Online Codes are Great. Really boosted the power of my online Pokemon Deck. Buy some of these Pokemon Plasma Storm pack codes and strengthen your deck too!! !